Discrimination between children in formal and informal Kinship Care. In it’s answers the Scottish Government states that ‘At 31 July 2012 there were 4,076 children living in formal kinship care arrangements in Scotland’, while ‘The Scottish Government estimates the figure for informal kinship care is around 15,668‘ (S4W-17314) or 1.5% of children in Scotland (S4W-17312). Although the vast majority of Kinship Care arrangements are informal the Scottish Government states that they ‘do not collect information on non-looked after children living in kinship care arrangements‘ (S4W-17437). The answers to two other questions (S4W-17437 and S4W-17416) make it clear that ‘local authorities are not currently obliged to provide specific support to those in informal kinship care arrangements, except under their general duties set out in section 22 of the Children (Scotland) Act 1995′. Though a number of Local Authorities do provide support to those on a section 11 under section 22 and 50 of the Children (Scotland) Act 1995, recognising the needs of these often vulnerable children, the Scottish Government states that ‘Information on the number of carers of children living in informal care arrangements who receive financial support from their local authority is not centrally held’ (S4W-17439). It may seem surprising that the Scottish Government does not collect or hold information on the numbers of children in informal Kinship Care, or what support is available to them – though they recognise that they are a very large group. It is even more shocking that there is no obligation for Local Authorities to support them at all, though luckily many do give some support. It is even more surprising in the context that the Scottish Government’s Children and Young People’s Bill proposes new legislation, and potentially new support, for those on a section 11 order, and also proposes trying to reduce the number of formal care arrangements over time. What research has informed this Bill if the basic figures requested in our questions are not known? Another of the questions asked whether children in formal and informal Kinship Care have comparable needs. It is our contention that the vast majority do – since they are born into the same, often traumatic, circumstances, and display many of the same symptoms of their trauma which require extra support. We wanted to highlight the arbitrary nature of this division between children in formal and informal Kinship Care. The Scottish Government’s answer agrees to some extent that ‘Children in informal kinship care arrangements are not deemed to require formal supervision but may have other support needs‘ (S4W-17315) and goes on to note that the new Bill aims to provide additional support. But the new Kinship Care Order legislation does not come with a financial allowance for informal kinship carers, or specialist psychological and educational services – the main priorities for all children in Kinship care, which groups represented by the Alliance have long lobbied for for formal and informal Kinship Care placements. In another question we asked the Scottish Government whether psychological and therapeutic services are available as a priority to children in formal and informal Kinship Care. Their answer shows a naivety or ignorance of the provisions available, as they state that all children have access to psychological services based on need, and that Additional Support for Learning is also available to all according to need, though Looked After (formally cared for) children are automatically entitled to it (S4W-17317). The reality is that there are long waiting lists for CAMHS (Child and Adolescent Mental Health Service) and it is often only by having formally Looked After status, that Kinship Carers can get referrals and timely access to the services, even via the Corporate Parent (the local councillor) if no progress is being made through other means. Without this formal recourse those on section 11 often have little chance of being seen by these services. All the evidence shows that therapeutic intervention in these kids lives should be as early as possible to prevent the worst types of damage. Additional Support for Learning is theoretically available to all children in need of it, but in many cases is not promoted by schools and Kinship Carers (particularly informal) can find themselves having to fight for it, rather than it being readily available. The Scottish Government’s lack of knowledge about the availability of support for both formal and particularly informal Kinship Care children is worrying in the context of the new Bill, which proposes reducing the number of formal Kinship Carers over time, and does not provide passported access to psychological and educational services for those on the new Kinship Care Order. We argue that the Scottish Government must understand the barriers to current provisions – which may seem to be in place on paper, but in reality are simply not being delivered – before designing new legislation. Discrimination between children in Kinship and foster care. If the Children’s Hearing recognises that children in foster and formal Kinship Care have the same ‘needs’ which require them to be placed on a Supervision Order, then both should receive the same support to meet those needs and ensure they are safe and well. We are referring to psychological and educational support, a basic allowance to support the child, and respite for the carer, which are not currently available to children in formal Kinship Carers as they are to children in foster care. Question S4W-17447 goes on to again claim that psychological services (CAMHS) and Additional Support for Learning are equally available to children in formal Kinship and foster care, and also suggests that respite is available to Kinship Carers through Government funded charities such as Geeza break. Though some formal Kinship Carers do get access to CAMHS and occasional breaks from respite services, they are not entitled to these services as foster carers are, and are desperately in need of them. This answer shows the same naivety or ignorance of the true provisions of services on the ground for Kinship Carers on the part of the Scottish Government. Question S4W-17441 asked about the cost difference of keeping a child in residential, foster and kinship care for the Local Authority. No answer was given, but the question aimed to point out comparatively how little is spent on supporting Kinship Care placements (which are proven to be the best place for children unable to live with their parents as the Scottish Government notes in its answer to S4W-17443), while also demonstrating that Kinship Care will always be by far the cheapest option for the Scottish Government, since we recognise that Kinship Carers do not require, or want, a wage like foster carers receive. However, they do deserve an allowance which is sufficient to prevent poverty or stress in the placement. We contend that children in foster, residential, formal and informal Kinship Care have the same needs, and could equally end up in any one of those forms of care depending on their family circumstances. Children with comparable needs should have access to the same services to help them recover from early life traumas and have an equal chance to other kids. Their carers should not suffer in poverty or without a break. In another case of naivety or ignorance the Scottish Government claims that babies who are kept in hospital due to withdrawal from foetal alcohol, methadone or other substances, receive the same set of services if they go home to a Kinship Carer or with their parents (S4W-17408). We have held seminars with midwives, nurses and paediatricians in Glasgow who were shocked to hear multiple stories of how services dropped away when a withdrawal baby went home to a ‘safe place’ with a Kinship Carer rather than to their parents where they are still deemed ‘at risk’. In it’s answer to question S4W-17414 the Scottish Government admits that they have not commissioned any research on foetal alcohol and methadone syndromes, separation anxiety or attachment disorder, which affect many children in Kinship Care. In fact the body of research on these disorders is very slim, which is one reason why treatment has also not been as effective as it could be, particularly on foetal alcohol and other drug syndromes which can have serious health impacts which arise later in a child’s development. Evidence has shown however that all of these early life traumas are most effectively minimised by treating them as early as possible – this means giving therapies and other assistance before the symptoms have appeared in many cases, rather than waiting until problems become acute, as is currently the case. We would encourage the Scottish Government to commission some research into these issues, their prevalence in children living away from their parents in various forms of care, and effective treatment, so that services can be directed accordingly. To ask the Scottish Government what its position is on the finding in the report, Spotlight on Kinship Care, that (a) in 2001, one in every 71 children in Scotland was being brought up by grandparents or other relatives and (b) informal kinship carers save the taxpayer between £23,500 and £56,000 a year, despite many of these carers finding themselves in poverty. Answer: The Scottish Government is aware of the report and its findings. The figures given for savings reflect a view that these children would otherwise be looked after in foster care or residential care. This does not reflect the reality that in general, families recognise their responsibility to look after children of the wider family when this is needed, but they are looking for more support in doing so. We believe that kinship carers of non-looked after children should be supported, as any parents would, through the welfare system. The UK government needs to ensure the benefits system matches the needs of kinship carers. It is true that families do feel a passion and a responsibility to take care of their relatives, which is the natural urge of a grandparent, aunt or family friend. This is how most Kinship Carers find themselves in the stressful position of being a full time carer, which they are usually grateful to be able to provide for their kin. However, as the Scottish Government rightly point out they are looking for more support in doing so since it is not acceptable that they should live in poverty and without basic services while doing this valuable service to society as a whole. We also continue to assert that many more relatives would take care of their kin if adequate support was put in place so that they could give up jobs, and take on traumatised children knowing that there would be adequate support to fall back on. If Kinship placements are not encouraged and properly supported then many more children will end up in foster and residential care, costing the Local Authority millions more, and subjecting children to increased instability and poorer outcomes. When a child becomes formally Looked After due to being considered ‘at risk’ they are principally the responsibility of the Local Authority, who places that child with a Kinship family or in foster care. The Scottish Government has recently suggested (in the Children and Young People’s Bill) that a number of Looked After Children in Kinship Care may not require that level of state interference, and that some Kinship Carers want to keep Looked After status as a ‘perverse incentive’ to get access to more services. It is indeed true that many Kinship Carers find that the only way to access essential services and allowances is by having formal status. The answer goes on to suggest that the benefits system should be the primary source of support for informal Kinship Carers. There are several flaws in this argument. Firstly that (as argued in previous sections of this article) informal Kinship Care children also require access to services which are only available as a priority to Looked After children. Secondly, current benefits are not adequate to support these vulnerable children when their carers are aged, unable to work alongside their care duties and have other issues. Thirdly, we would make the point that this SNP Government is hoping to achieve Scottish independence, after which the Scottish Government would be in responsible for benefits, as they confirm in their answer to question S4W-17435. What kind of benefits would they intend to provide for Kinship Care families in an independent Scotland? Given their aspirations it seems unreasonable to shift the blame to the UK benefits system which they hope to be in control of without providing some proposal for how it could work better. “it is unlawful and a breach of the European Convention of Human Rights for a Local Authority to have a policy to pay Kinship Carers a lower rate of fostering allowance than that paid to Foster Carers, who are not relatives/friends of the child”. The judgement found the policy of Manchester Council to be both irrational and contrary to Articles 8 and 14 of the European Convention on Human Rights. Since then this precedent has been tested a number of times in England and Northern Ireland, but as yet not in Scotland. 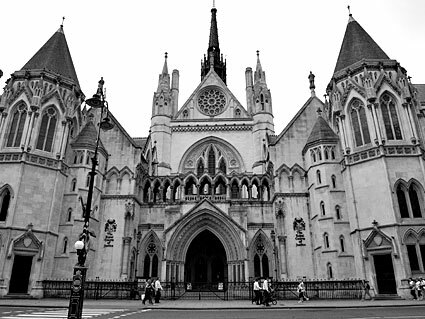 Most notably a recent case in Tower Hamlets, London, was taken to the court of appeals who ‘unequivocally’ ruled that foster and kinship LAC placements should be paid the same amount. 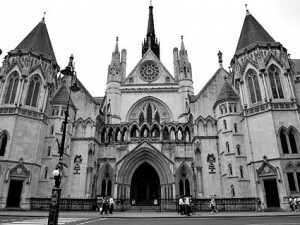 The Munby judgement is an English case relating to a particular local authority’s policy on the payment of foster carers and the interpretation of English legislation and so therefore it does not have any direct impact in Scotland. In fact if tested in Scottish courts (which has not happened yet) it is likely that this ruling would apply to Scotland, since foster children and formal kinship care children have the same legal status yet are treated differently. The ruling was tested in Northern Ireland and was found to be relevant there despite their different laws. The fact is that this is a clear case of discrimination under Human Rights legislation which Scotland is a signatory to. The Scottish Government are attempting to skirt this issue, and further, their attempt to reduce the number of Kinship Care placements which are formally Looked After will also serve to reduce the number of families for whom this legal argument is applicable. In their answer to question S4W-17431 the Scottish Government state that ‘No guidance has been issued to local authorities in relation to reducing the numbers of children receiving formal kinship care’, while another answer shows the rapid rise in formal Kinship Care from 3223 in July 2010 to 4076 in July 2012 (S4W-17430). Yet, the financial memorandum of the new Children and Young People’s Bill states that the aim of the proposed Kinship Care Order is to ‘reduce the unchecked growth in formal Kinship Care’. It has been widely publicised that Local Authorities are finding it hard to deal with the increase in Looked After Children in Kinship Care, who are entitled to certain allowances and provisions. It is clear that the Scottish Government is attempting to reduce these figures. However, given that, as the Scottish Government state in response to an earlier question: ‘Children in formal kinship care arrangements are deemed by the Children’s Hearings System to have needs which require them to be placed under a compulsory supervision order’ (S4W-17444), how can this number be reduced by legislation? If Children’s hearings deem these kids to be ‘at risk’ then they deserve this status, which is based on an evaluation of need. We are very concerned that the Scottish Government and Local Authorities are simply attempting to save money by reducing the numbers of Looked After children in Kinship Care. This is in fact clearly spelled out in the financial memorandum of the proposed Bill where they propose that money will be saved over the coming years by reducing the number of Looked After kinship placements (see our response to the Bill here). In many of it’s answers the Scottish Government promotes its funding of three major charities: CHILDREN 1st, Mentor UK and Citizens Advice Scotland as one of its main actions on Kinship Care, particularly for informal Kinship Carers. In question S4W-17417 they confirm that during 2013 and 2014 they will provide £446,109 to Children 1st to deliver their Kinship Care National Training and Outreach Service and £305,700 to Citizens Advice Scotland for their dedicated Kinship Care Advice and Information Service. They will also provide Mentor UK £175,000 to research the best ways to ‘break the inter-generational cycle of children becoming looked after and having poorer outcomes’. The funding of these major charities has been very contentious among Kinship Carers and Kinship Care support groups across Scotland. 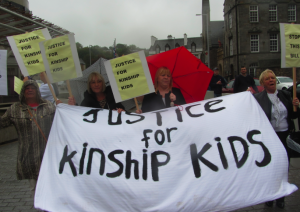 In fact, the Scottish Kinship Care Alliance (which represents groups in 22 out of 32 Local Authorities) was formed in response to the funding of CHILDREN 1st to ‘represent Kinship Carers’ to the Scottish Government. 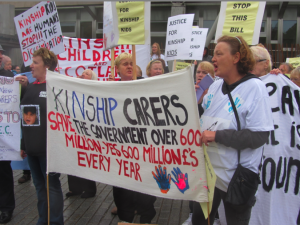 Kinship Carers did not, and do not, feel that this Government funded body are able or willing to represent their campaigns or needs, and resolved to form the Alliance to do so more effectively themselves. Many Kinship Carers have argued that directing money towards these charities is not the best use of funds, and funds would be better put directly into Kinship care support groups, or funding effective services for the psychological and educational needs of Kinship children on the ground. When asked ‘what information it has on the support of kinship carers for the Children 1st Kinship Care project’ (S4W-17422) the Scottish Government cited Children 1st’s own user surveys on the success of their Kinship Care phone helpline (via parentline) and other projects. They failed to mention the widespread opposition to the Children 1st project from a number of kinship groups (which they are well aware of), who feel the charity does not represent their views as it was tasked to in its representations to the Scottish Government, including specifically CHILDREN 1st’s response to the Children and Young People’s Bill. 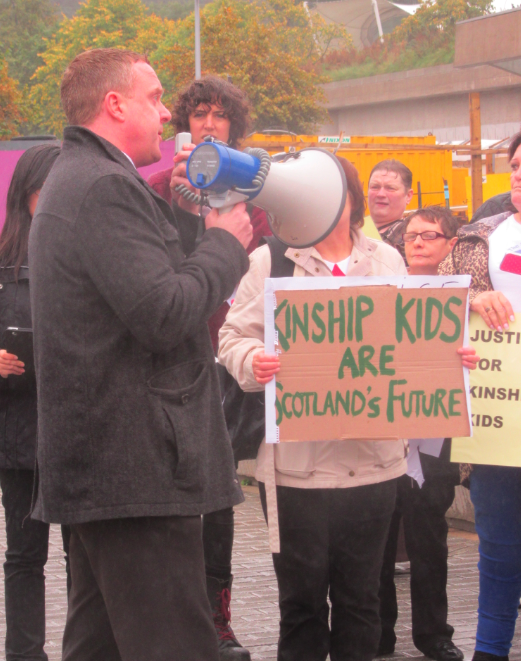 Further, there is concern that it is being used as a lightening rod for the Scottish Government as Kinship Carers have been asked to talk to CHILDREN 1st about their concerns rather than directly to the Scottish Government. 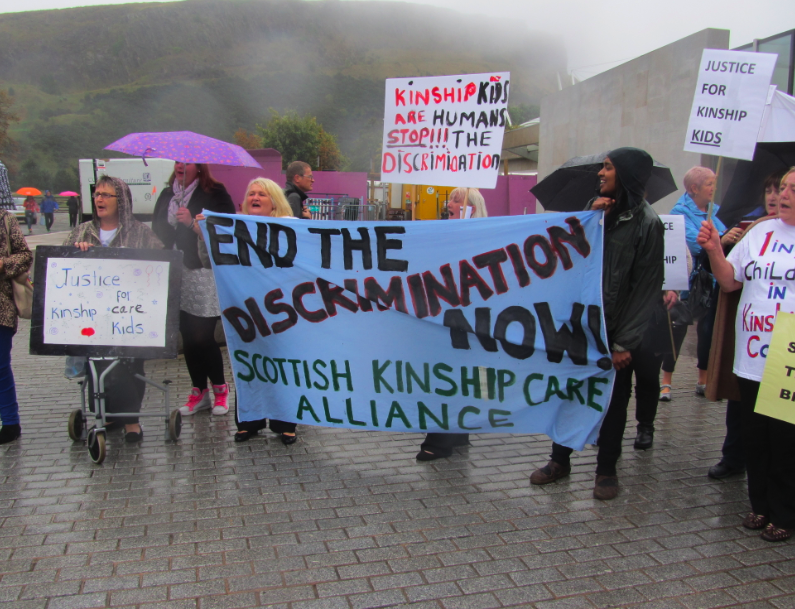 In several responses the Scottish Government claims to have ‘engaged regularly with kinship carers from across Scotland, including groups such as the Scottish Kinship Care Alliance’ (S4W-17426). The Alliance has met the Scottish Government twice since it’s inception in April 2013 – once with civil servants on the Children and once with the Children’s Minister who called a last minute meeting with the group as a result of their national demonstration outside the Scottish Parliament. We look forward to engaging more closely with the Scottish Government and representing the views of Kinship Carers across Scotland directly to them, rather than via large charities and third parties who may not accurately represent the grassroots views of the real experts on the Kinship issue – Kinship Carers themselves. We agree with the Poverty Truth Commission that the solutions to social issues such as Kinship Care will never be found until those who know the issue first hand are at the heart of policy making, and are considered a key part of the solution, rather than treated as part of the problem. (S4W-17427) Jean Urquhart (Highlands and Islands) (Independent): To ask the Scottish Government what work it has carried out in the last three years to establish and consolidate links with groups, charities and other non-governmental bodies that have specialist knowledge and skills in kinship care arrangements. Since April 2011, the Scottish Government has funded Children 1st, Citizens Advice Scotland and Mentor UK to provide support to kinship carers. Funding these organisations has led to us regularly engaging with individual kinship carers and kinship care groups such as the South West Kinship Care Group, Grandparents Parenting Again, Kinsfolk Carers and the Scottish Kinship Care Alliance, on a variety of kinship care issues. The Scottish Government has also engaged with other key third sector organisations such as Child Poverty Action Group and Children in Scotland. These meetings are in addition to our extensive consultation on the proposals set out in the Children and Young People (Scotland) Bill. (S4W-17426) Jean Urquhart (Highlands and Islands) (Independent): To ask the Scottish Government whether it takes account of the views and experiences of (a) kinship carers and (b) children with (i) formal, (ii) informal and (iii) other kinship care arrangements or who are subject to (A) residence and (B) supervision orders and, if so, how it does this and since when. 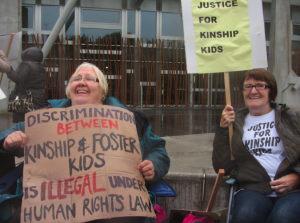 The Scottish Government has regularly sought the views and experiences of all kinship carers and children living in kinship care arrangements whether formally through a supervision order or informally , including through a residence order. In seeking the views and experiences of kinship carers, the Scottish Government has engaged regularly with kinship carers from across Scotland, including groups such as the Scottish Kinship Care Alliance. To seek the views of children and young people, including those in a range of care arrangements we have engaged with organisations that have expertise in working with children and young people, such as Children 1st, Who Cares, Through Care and Aftercare Forum, Children’s Parliament, Scottish Youth Parliament, Young Scot and others. (S4W-17424) Jean Urquhart (Highlands and Islands) (Independent): To ask the Scottish Government how many meetings it has had with organisations regarding kinship care since April 2011, broken down by group. Since April 2011 the Scottish Government has met with Children 1st, Citizens Advice Scotland, Mentor UK, the Child Poverty Action Group, Children in Scotland and kinship care groups such as the South West Kinship Care Group, Grandparents Parenting Again, Kinsfolk Carers and the Scottish Kinship Care Alliance, on many occasions to discuss a variety of kinship care issues. (S4W-17423) Jean Urquhart (Highlands and Islands) (Independent): To ask the Scottish Government what meetings it has had with (a) Children 1st and (b) kinship care support groups since April 2011. Since April 2011, the Scottish Government has met with Children 1st and kinship care support groups on many occasions to discuss a variety of kinship care issues. These meetings are in addition to our extensive consultation on the proposals set out in the Children and Young People (Scotland) Bill. (S4W-17422) Jean Urquhart (Highlands and Islands) (Independent): To ask the Scottish Government what information it has on the support of kinship carers for the Children 1st Kinship Care project. The Scottish Government funded Kinship Care National Training and Outreach Service delivered by Children 1st is the first service of its kind in Scotland which builds the capacity of carers and their communities to help each other. Providing regular support and information to over 509 kinship carers and 42 groupsacross Scotland the service has helped to helped create new peer support groups and given voice to carers. 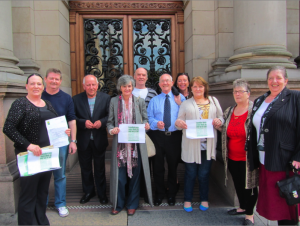 Children 1st carried out a service user survey between 16 May and 13 June 2013. The results of this survey can be found at the attached link. (S4W-17421) Jean Urquhart (Highlands and Islands) (Independent): To ask the Scottish Government for what reason it has not published the response by the New Fossils, East Glasgow Kinship Care support group to the Children and Young People (Scotland) Bill. 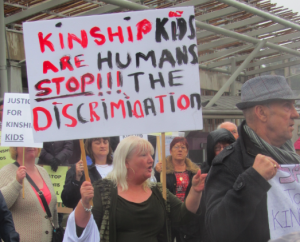 The New Fossils, East Glasgow Kinship Care support group did not formally submit a response to the Children and Young People (Scotland) Bill Consultation which closed on 25 September 2012. They did however, send an email on 15 October 2012 outlining their views on the proposals in the Bill. An official reply to this email was issued to the group on 23 November 2012. (S4W-17420) Jean Urquhart (Highlands and Islands) (Independent): To ask the Scottish Government for what reason kinship carers were not invited to join the Carers Parliament in 2012. The invitations to attend the Carers Parliament in 2012 were widely circulated throughout Scotland. Carers were invited to self-nominate from each geographical area. Thereafter the selection process to attend the Carers Parliament involved two delegates being selected from each of the 73 Scottish parliamentary constituencies to represent carers interests across Scotland. Kinship carers who also had caring responsibilities were eligible to attend. (S4W-17419) Jean Urquhart (Highlands and Islands) (Independent): To ask the Scottish Government for what reason kinship care was not included in its 2010-2015 carers strategy. that kinship carers are different from carers in that they are the family and friends of young people who are in the care system or are at risk of coming into the care system. A Kinship carer can also be a carer if, for example, the child they are caring for has a disability and/or if the kinship carer is also caring for their partner, parent or someone else. that kinship carers should be supported if they have caring responsibilities as well as kinship caring responsibilities. (S4W-17418) Jean Urquhart (Highlands and Islands) (Independent): To ask the Scottish Government what its position is on the responses of (a) support groups for kinship carers and (b) the Scottish Kinship Care Alliance to the kinship care orders proposed by the Children and Young People (Scotland) Bill. The Scottish Government has outlined its position on all the responses to the Children and Young People Bill proposals, including those on kinship care orders, in the Scottish Government Response To ‘A Scotland for Children: A Consultation on a Children and Young People Bill’. (S4W-17437) Alison Johnstone (Lothian) (Scottish Green Party): To ask the Scottish Government what information it has regarding how much it has cost each local authority to provide services for children with (a) formal and (b) informal kinship care arrangements in each of the last three years. Information regarding how much it has cost each local authority to provide services for children with (a) formal and (b) informal kinship care arrangements in each of the last three years is not centrally held by the Scottish Government. The data that we collect from local authorities on looked after children is about demographic information and not the cost of keeping a child in care. We do not collect information on non-looked after children living in kinship care arrangements as local authorities are not currently obliged to provide specific support to those in informal kinship care arrangements, except under their general duties set out in section 22 of the Children (Scotland) Act 1995. Estimated costings of some of the services provided to children living in formal and informal kinship care arrangements in relation to the Kinship Care Order proposed through the Children and Young People (Scotland) Bill can be found at pages 65 – 75 of the Bill Financial Memorandum. (S4W-17436) Alison Johnstone (Lothian) (Scottish Green Party): To ask the Scottish Government what plans it has to review the needs of children in kinship care and their carers and what recent work it has carried out on this. The Scottish Government, through the organisations we fund such as Children 1st, Citizens Advice Scotland and Mentor UK, will continue review the needs of children in kinship care. We will also continue to engage with individual kinship carers and kinship care groups such as the Scottish Kinship Care Alliance, Kinsfolk Carers and Grandparents Parenting Again. We have just recently completed an extensive engagement period with kinship carers, kinship care groups and other key stakeholders, such as those mentioned above during the consultation of the Children and Young People Bill. (S4W-17440) Jackie Baillie (Dumbarton) (Scottish Labour): To ask the Scottish Government how many children with (a) formal, (b) informal and (c) other kinship care arrangements have been placed on the child protection register in each of the last three years. The Scottish Government does not hold data centrally on (b) informal or (c) other kinship care arrangements. Individual-level child protection data is only held centrally as at 31 July 2012, so data for (a) formal care is not available over time. On 31 July 2012 there were 149 children with formal kinship care arrangements who were also on the child protection register. (S4W-17446) Jackie Baillie (Dumbarton) (Scottish Labour): To ask the Scottish Government what information it has on how many children in kinship care have siblings in (a) residential and (b) foster care. (S4W-17447) Jackie Baillie (Dumbarton) (Scottish Labour): To ask the Scottish Government whether children in kinship and foster care have the same access to (a) housing benefit, (b) carers respite, (c) psychological services and (d) educational services. Both Kinship and Foster Care Allowances are fully disregarded as income for Housing Benefit. The Scottish Government is providing over £13 million for short breaks (respite) between 2010-15 to be channelled through the voluntary sector. We know that organisations supporting Kinship Carers such as Children 1st and Geeza Break have benefitted from this fund. Access to Child and Adolescent Mental Health Services (CAMHS) is available to all children and young people equally and is assessed on their clinical needs. The Education (Additional Support for Learning) Act 2009places education authorities under a duty to identify, meet and review the additional support needs of all children and young people for whose education they are responsible. The Act automatically deems all children and young people who are looked after to have additional support needs, unless the authority determine that they do not require additional support to benefit from their school education. (S4W-17444) Jackie Baillie (Dumbarton) (Scottish Labour): To ask the Scottish Government what its position is on whether children in kinship care have comparable needs to those in foster or residential care. Children in formal kinship care arrangements are deemed by the Children’s Hearings System to have needs which require them to be placed under a compulsory supervision order. Children in informal kinship care arrangements are not deemed to require formal supervision but may have other support needs. The Kinship Care Order proposed through the Children and Young People (Scotland) Bill aims to provide additional support, that will offer a more stable environment for children living in kinship families, who do not require regular supervision from the Children’s Hearings System or Social Work. (S4W-17442) Jackie Baillie (Dumbarton) (Scottish Labour): To ask the Scottish Government what its average annual expenditure will be for (a) formal and (b) informal kinship care placements if kinship care orders are introduced and what information it has on what the cost will be for local authorities. The Scottish Government does not pay for care placements directly but supports local authorities through block grant funding. Table 28 of the Children and Young People (Scotland) Bill Financial Memorandum sets out what the Scottish Government estimates that local authorities will spend on formal care following the introduction of the proposed kinship care order. The estimated cost of specific new support to informal kinship carers in possession of a Kinship Care Order from 2015-16 is set out in table 32 of the Children and Young People (Scotland) Bill Financial Memorandum. (S4W-17441) Jackie Baillie (Dumbarton) (Scottish Labour): To ask the Scottish Government what the average cost has been of keeping a child in (a) residential, (b) foster and (c) kinship care in each of the last three years and what research it has carried out on the cost differentials. Information on what the average cost has been of keeping a child in (a) residential, (b) foster and (c) kinship care in each of the last three years is not centrally held and no research has been carried out on cost differentials. (S4W-17439) Jackie Baillie (Dumbarton) (Scottish Labour): To ask the Scottish Government what information it has on how many carers with (a) formal and (b) informal care arrangements receive financial support packages from their local authority. At 31 July 2012 there were 4,076 children living in formal kinship care arrangements in Scotland. All carers of children in formal kinship care arrangements are entitled to receive financial support from their local authority. Information on the number of carers of children living in informal care arrangements who receive financial support from their local authority is not centrally held. (S4W-17438) Jackie Baillie (Dumbarton) (Scottish Labour): To ask the Scottish Government what impact the so-called the Munby judgement (R v Manchester Council, ex parte L and others, and ex parte R and others), has had on its approach on differences between how foster and kinship carers are treated. The Munby judgment is an English case relating to a particular local authority’s policy on the payment of foster carers and the interpretation of English legislation and so therefore it does not have any direct impact in Scotland. (S4W-17445) Jackie Baillie (Dumbarton) (Scottish Labour): To ask the Scottish Government for what reason there are differences between the levels of support offered for children in formal kinship care and foster care placements. The Scottish Government believes that the needs of children should be the determining factor behind decisions about placements and what support is provided. This is set out in our 2007 strategy Getting it Right for Every Child in Kinship and Foster Care. The Scottish Government fully recognises the value of keeping children within the family unit, minimising disruption in their lives and reinforcing the child’s sense of identity and self-esteem. Published research as well as on-going engagement with kinship carers has heavily influenced our policy making and that is why we have, through the Children and Young People Bill, introduced additional support to kinship carers and families in the early stages of distress. (S4W-17417) Michael McMahon (Uddingston and Bellshill) (Scottish Labour): To ask the Scottish Government what support it provides to kinship carers who provide informal care arrangements. Children in informal kinship care arrangements are not deemed to require formal supervision but may have other support needs. In recognition of those needs, the Kinship Care Order proposed through the Children and Young People (Scotland) Bill aims to provide additional support, that will offer a more stable environment for children living in kinship families, who do not require regular supervision from the Children’s Hearings System or Social Work. In financial years 2012-13 and 2013-2014, we are providing funding of £446,109 to Children 1st to deliver the Kinship Care National Training and Outreach Service and £305,700 to Citizens Advice Scotland to deliver a dedicated Kinship Care Advice and Information Service. We are providing Mentor UK with a two year Strategic Funding Partnership Grant of £175,000 to help break the inter-generational cycle of children becoming looked after and having poorer outcomes. Mentor UK were also funded by the Scottish Government to produce a resource guide for kinship carers. The guide, Kinship Care – children cared for by family and friends, aims to inform kinship carers and help them to have a better understanding of what is involved in taking on the care of a child, it also explains what support they may expect to receive. (S4W-17416) Michael McMahon (Uddingston and Bellshill) (Scottish Labour): To ask the Scottish Government what duties local authorities have in relation to informal kinship care placements and what guidance it provides to them on what support should be provided to the carers. Local authorities are not currently obliged to provide specific support to those in informal kinship care arrangements, except under their general duties set out in section 22 of the Children (Scotland) Act 1995. In 2007 and 2008 the Scottish Government published the documents Getting It Right for Every Child in Kinship and Foster Care and Moving Forward in Kinship and Foster Care to identify good practice in kinship and foster care across Scotland. (S4W-17415) Michael McMahon (Uddingston and Bellshill) (Scottish Labour): To ask the Scottish Government how many informal kinship care placements under section 11 of the Children (Scotland) Act 1995 have been applied for in each of the last three years and how many permanence orders were granted. Information on the numbers of children living in informal kinship care placements under section 11 of the Children (Scotland) Act 1995 is not centrally held. (S4W-17414) Michael McMahon (Uddingston and Bellshill) (Scottish Labour): To ask the Scottish Government whether it has researched or will research whether there is a link between kinship care and the likelihood of developing (a) foetal alcohol and methadone syndromes, (b) separation anxiety and (c) attachment disorder. The Scottish Government has not researched whether there is a link between kinship care and the likelihood of developing foetal alcohol and methadone syndromes as these both develop during pregnancy as a direct result of a mother drinking alcohol excessively or using methadone. The Scottish Government has also not researched separation anxiety and/or attachment disorder. However, we do recognise that some children within the care system may experience this at some point and that it is related to a child’s early life experiences and the impact of poor attachment from birth. 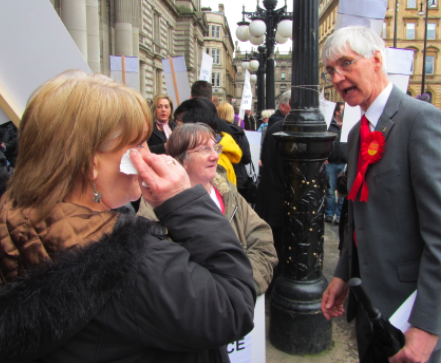 (S4W-17413) Michael McMahon (Uddingston and Bellshill) (Scottish Labour): To ask the Scottish Government what research on kinship care arrangements it has funded in each of the last three years and whether it plans to fund future research on this. As part of the on-going funding to CHILDREN 1st National Kinship Care service and Citizens Advice Scotland we continually seek the views of individual kinship carers, kinship carer groups and key stakeholders in respect of arrangements, resources and learning needs. In addition over the next 2 years, through strategic funding partnerships, the Scottish Government also funds the Mentor Foundation UK to undertake work to look at breaking the inter-generational cycle of children being looked after and having poorer outcomes. (S4W-17412) Michael McMahon (Uddingston and Bellshill) (Scottish Labour): To ask the Scottish Government what progress it is making with its review of kinship care allowances and when it will be published. The Scottish Government is currently carrying out a review of financial support to formal kinship carers, with a view to tailoring support and tackling inconsistencies across Scotland. We aim to publish the findings by the end of 2013. To ask the Scottish Government what discussions it has had regarding how kinship care would be resourced in an independent Scotland. Independence would enable the Scottish Government to take spending decisions on a range of issues, including kinship care, which reflect the needs and desires of the Scottish people and allow us to prioritise the public services, policies and outcomes which best serve Scotland’s needs. To ask the Scottish Government whether it will provide extra funding to support kinship care placements. The Scottish Government will provide funding as set out in The Financial Memorandum page 75. This shows a lower estimated cost in 2015–16 of £1,433,512 and an upper estimated cost of £3,897,160. 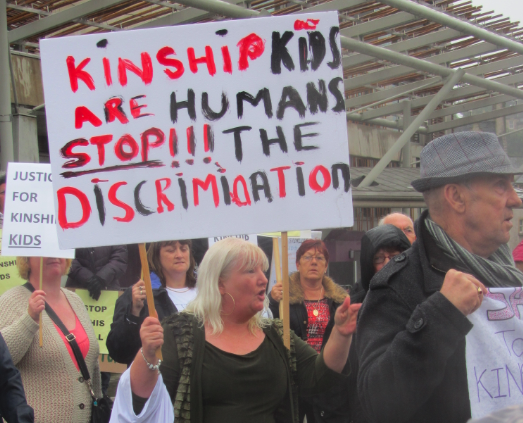 To ask the Scottish Government whether it considers that there are barriers to the full implementation of the kinship care orders proposed by the Children and Young People (Scotland) Bill and, if so, what these are. The Scottish Government is currently taking submissions from stakeholders in relation to the Bill and this includes views on barriers to implementation. Evidence sessions are also being heard by Education and Culture Committee on Stage 1. To ask the Scottish Government whether it has commissioned research on whether there are barriers to the full use of the available legislation for the provision of kinship care placements. The Scottish Government has funded CELCIS (the Centre for Excellence for Looked after children In Scotland) specifically to address issues and improve practice for Looked After Children. Further, significant engagement has been undertaken with a wide range of stakeholders to explore areas where legislation or practice could be improved to achieve better outcomes for children and young people and this consultative work is currently on-going. To ask the Scottish Government whether it has issued guidance to local authorities on reducing the number of children receiving formal kinship care. No guidance has been issued to local authorities in relation to reducing the numbers of children receiving formal kinship care. To ask the Scottish Government how many children have been given formal kinship care status in each of the last three years. To ask the Scottish Government whether priority access to specialist psychological and therapeutic services will be available to children subject to kinship care orders under the Children and Young People (Scotland) Bill. All children in need are entitled to access services and those with a kinship care order will require to ask for a referral in the same way as families of other children. The therapeutic services introduced by the Bill will be available to all children and will be available based on need not status. It is further expected that the statutory implementation of a “named person” will allow families to access services more easily. To ask the Scottish Government what information it has on the average number of standard grade passes for pupils in kinship care in each of the last three years and how this compares with pupils (a) who live with their parents, (b) in foster care and (c) in residential care homes. The Scottish Government collects information on average tariff scores of looked after children (total points earned across different qualifications) but not standard grades specifically. The attached link to table 1.3 of the Scottish Government publication Education Outcomes for Scotland’s Looked After Children 2011-2012 provides information on the average tariff score of looked after children who left school by placement type. This information refers only to looked after children who left school during the academic year and spent the entire academic year in a single placement, therefore it covers only a small number of children. A link to the publication is attached. To ask the Scottish Government what its position is on the benefits of kinship care. Legislated in 2009 to recognise kinship care for the first time. Funded Children 1st, Citizens Advice Scotland, Mentor UK and the Child Poverty Action Group to provide support to kinship families. To further improve on support to kinship families we are conducting a review of financial allowances to kinship carers with a view to tailoring support and tackling inconsistencies across Scotland. We are also, through the Children and Young People Bill, providing additional support to many more kinship carers and families who are in the early stages of distress. 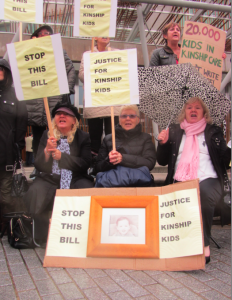 To ask the Scottish Government what research has been carried out on the benefits of kinship care for children who cannot live with their birth parents; whether further research has been proposed, and how it will ensure that kinship care is (a) prioritised and (b) supported. The Scottish Government has not carried out research in relation to the benefits of kinship care for children who cannot live with their birth parents although extensive international research has been conducted including the Mentor Foundation UK study, “EU Kinship Carers Project” and reviews of family group conferencing and the benefits of children remaining in the care of the wider family. Over the next two years, through a strategic funding partnership, the Scottish Government is funding Mentor Foundation UK to undertake work to look at breaking the inter-generational cycle of children being looked after receiving poorer outcomes. Kinship care continues to be a priority for the Scottish Government and the introduction of the kinship care order, as an addition to other options to secure permanence for children and young people will ensure that even more kinship families are being supported. To ask the Scottish Government what services are available to support newborn babies with alcohol or drug withdrawal symptoms who (a) go home with their parents and (b) enter a kinship care placement. If the mother is already known to maternity or social care services, prior to delivery, then there will be pre-birth, multi-agency planning meetings. The outcome of these meetings would be to agree a care plan for both mother and baby post-delivery and subsequent follow up meetings will be scheduled. Many infants with Neonatal Abstinence Syndrome (NAS) require admission to a neonatal unit (NNU) for medication, observation and expert medical and nursing care. The length of hospital stay either in a neonatal unit or postnatal ward would be dependent upon the severity of NAS in each case. To ask the Scottish Government how it provides (a) pastoral care and (b) help with behavioural difficulties resulting from early years traumas for pupils in kinship care and what support it provides to help get parent/guardian consent for extracurricular activities. The issue of consent for extracurricular activities and the provision of pastoral care and help with behavioural difficulties for all pupils, including those in kinship care, is a matter for education authorities. Authorities are supported in delivering this through the Additional Support for Learning Act 2004 (as amended), and associated code of practice. This provides the framework for the provision of support to pupils who have additional support needs, including the need for pastoral care support and support for behavioural difficulties. Parents and Carers who care for pupils with additional support needs may benefit from the advice and information provided by Enquire, the national advice and information service for additional support for learning. In March 2013 we published Better Relationships, Better Learning, Better Behaviour, our updated policy on promoting positive relationships and behaviour in schools which emphasises the importance of whole school approaches and the responsibilities of all staff for identifying the care and wellbeing needs of all children and young people. Education Scotland’s Rights, Support and Wellbeing Team provides support and training to Local Authorities and schools in a range of whole school approaches to develop positive relationships and promote positive behaviour. For example, the approaches “Towards Social and Emotional Health and Wellbeing” and “Nurturing Approaches” include a variety of topics such as attachment, brain science, trauma, and barriers to a child’s learning and development. There are also Health and Wellbeing curricular programmes available such as Creating Confident Kids to support children develop their own emotional and social Health and Wellbeing. To ask the Scottish Government what guidance it has issued on the needs of pupils in kinship care. Under the Education (Additional Support for Learning) (Scotland) Act 2009 a child or young person looked after by a local authority (within the meaning of section 17(6) of the Children (Scotland) Act 1995 (c.36), including those in formal kinship care arrangements, is automatically deemed as having additional support needs until they are assessed otherwise. The Supporting Children’s Learning code of practice explains the duties on education authorities and other agencies to support children’s and young people’s learning. It provides guidance on the Act’s provisions as well as on the supporting framework of secondary legislation. Improving the Education of Looked After Children: A Guide for Local Authorities and Services Providers. Core Tasks for Designated Managers in Educational and Residential Establishments. These Are Our Bairns: A Guide for Community Planning Partnerships on Being a Good Corporate Parent. To ask the Scottish Government whether psychological and therapeutic services are available as a priority to children in kinship care subject to (a) a residence order under section 11 of the Children Scotland Act 1995 and (b) looked-after child status. Access to specialist psychological and therapeutic services is based on need and is the same for all children whether they have looked after status or not. The Named Person proposal in the Children and Young People (Scotland) Bill will ensure a single point of contact for services that children and families use and will further assist families in accessing the services they need. Under the Education (Additional Support for Learning) (Scotland) Act 2009 a child or young person looked after by a local authority (within the meaning of section 17(6) of the Children (Scotland) Act 1995 (c.36) including those in kinship care arrangements is automatically deemed as having additional support needs until they are assessed otherwise, however all children with Additional Support for Learning needs should be able to access support. The Scottish Government is aware of the report and its findings. The figures given for savings reflect a view that these children would otherwise be looked after in foster care or residential care. This does not reflect the reality that in general, families recognise their responsibility to look after children of the wider family when this is needed, but they are looking for more support in doing so. The Kinship Care Order, which we propose to put in place through the Children and Young People Bill, provides an alternative option in terms of securing permanence for children who cannot live with their birth parents and for the first time, makes statutory provision in relation to support. It will provide further support for eligible kinship carers, in recognition of their parenting role. To ask the Scottish Government whether children in formal kinship care have comparable needs to those in informal kinship care. To ask the Scottish Government how many (a) informal and (b) formal kinship care placements it estimates there will be in 2015. The Scottish Government estimates the figure for informal kinship care is around 15,668. This is based on the most recent evidence collected and trend assumptions. The rationale behind this estimate can be found at page 69, paragraph 125 of the Children and Young People (Scotland) Bill Financial Memorandum. The estimated number of children in formal kinship care placements in 2015 is 5,039. This estimate can be found in table 28, page 72 of the Children and Young People (Scotland) Bill Financial Memorandum. To ask the Scottish Government how much it estimates that (a) it and (b) local authorities will spend annually for each (i) formal, and (ii) informal kinship care placement, following the introduction of the proposed kinship care order. Local authorities are not currently obliged to provide specific support to those in informal kinship care arrangements, except under their general duties set out in section 22 of the Children (Scotland) Act 1995. The estimated cost of specific new support to informal kinship carers in possession of a Kinship Care Order from 2015-16 is set out in table 32 of the Children and Young People (Scotland) Bill Financial Memorandum. To ask the Scottish Government how many children in kinship care are living in (a) formal arrangements, (b) under section 11 orders of the Children (Scotland) Act 1995 and (c) other informal arrangements, also expressed as a percentage of all children in the country. At 31 July 2013 there were 4,076 (0.39%) children living in formal kinship care arrangements. Information on the numbers of children living in kinship care arrangements under a section 11 of the Children (Scotland) Act 1995 order and other informal arrangements is not centrally held but we estimate that the figure is approximately 15,668 (1.5%). This is based on the most recent evidence collected and trend assumptions. The rationale behind this estimate can be found at page 69, paragraph 125 of the Children and Young People (Scotland) Bill financial memorandum.